Morton bin Ryan Scully. Dunfermline bound? Or will the snake fancy a bite? We've now got 4 first team keepers on the books (at least at the moment). Plus Scully is mince. Ray likes him, might want rid of the other 3 and the Wolves kid might not have it. Pars more likely though so unlucky to them. United have announced the loan signing of keeper Ross Laidlaw (Hibs) until the end of the season. Matej Rakovan has been released from his contract. 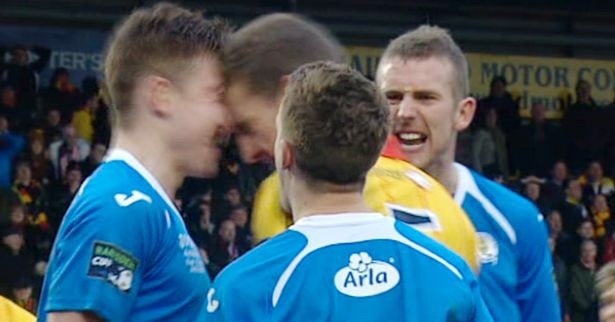 Right then, who fancies Big Aero ‘*** Punch’ Muirhead - guarantees 3 to 5 cracking penalties a season. Looks to be teaming up with his old mate Chris Higgins. Why? Because we’re signing Muirhead. He’ll either sign for a L1/L2 team next year or retire all together and remain part of our coaching staff. Think he will go part time this window and concentrate more on his personal trainer business. That's Scully official for us now. Don't understand it but I'm sure time will soon tell with this one. Playing him on Saturday and him playing a blinder would be peak Morton though. Aaron Muirhead signing confirmed for Ayr from Falkirk. Craig McGuffie joins Raith on loan and David Ferguson moves to Dumbarton on loan till the end of the season. Charlie Seaman joins on loan from Bournemouth today for the rest of the season and Josh Donaldson went on loan to Civil Service Strollers on 22nd December 2018. Was just about to update but seeing as it’s clearly annoying you I’ll just leave it until tomorrow. We've signed Darren McCauley from Colraine.